Good news that our programme about little Catharine Wordsworth will be going our on BBC Radio 4 on Sunday 5th November at 4.30 pm. 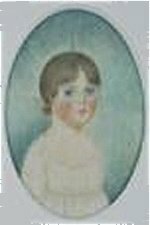 The Little Chinese Maiden is about Williams Wordsworth’s daughter Catharine, who died just short of her fourth birthday in 1812. Clearly a delightful little girl, she was the subject of two poems by her father: the somewhat clumsily-titled ‘Characteristics of a Child Three Years Old’, describing her delightful and playful personality, and ‘Surprised by Joy’, a very poignant poem written after her death, when the poet finds himself about to share a moment of happiness with the little girl and then realises that she’s died – and reproaches himself for having, even for a moment, allowed himself to forget the fact. This is of course a moment many of us have experienced after a death, and perhaps it’s a natural part of the recovery process, but it’s still so painful. And I wonder if the earlier poem, ‘Characteristic…’, has that rather clinical title because the often rather reserved poet found himself a little embarrassed by his own feelings for his daughter and when it came to finding a title, he wanted to play down the emotional involvement? Some years ago, when researching the life of Thomas De Quincey, a Wordsworth family friend, I began to wonder if little Catharine had had Down’s Syndrome. The condition hadn’t been recognised in those days and she wasn’t labelled, just seen as a delightful and slightly unusual child. In the Radio 4 programme, we look at the evidence, with the help of Wordsworth scholar Professor Simon Bainbridge, his wife Anne-Julie and daughter Grace; Beth Broomby and daughter Esme; and Dr Patricia Jackson, of Down’s Syndrome Scotland. We have passages from Dorothy Wordsworth’s letters beautifully read for us by Dr Pamela Woof, editor of Dorothy’s Journals and President of the Wordsworth Trust; abnd the poem ;Surprised by Joy’ read by Dr Jeff Cowton, Curator of the Wordsworth Museum, Grasmere. We had great fun making the programme; parents and children were wonderful and eloquent (even little Esme, who doesn’t talk but took over completely and made plenty of noise, as you’ll hear on the programme) – and I think the programme not only illuminates Wordsworth’s life and poetry but makes us think again about what we really value in people. What a wonderful programme.I have always admired the humanity of Wordsworth’s poetry.I have visited Allen Bank where the programme was recorded. I have spent my working life with people with learning disabilities. So it had many reverberations with me. Good to raise what we can learn from people without words who bring so much to enrich our lives. I began to listen to this but had to stop when guests arrived, one of whom surprisingly turned out to be a relative of a grandson (I guess) of John Langford Down after whom the condition is now named. Have you been to the Museum at Normansfield, Twickenham where JLD set up and managed an enlightened ,then, hospital/asylum. The curator there is an expert on the syndrome. I hope to recommence my listening later. Sorry that I cant be at your talk at Lorton later this week;; and hope there is a good turnout etec. I was fascinated by your sensitive account, including the interviews and readings. Thank you. I attended your lecture on DeQuincey’s Malaysian at the Wordsworth Conference in 1992. I continue to refer to it among colleagues and in my teaching.